Exchanging messages between systems is mostly implemented using XML files, which are specified with xml schema definitions, i.e. XSD files. 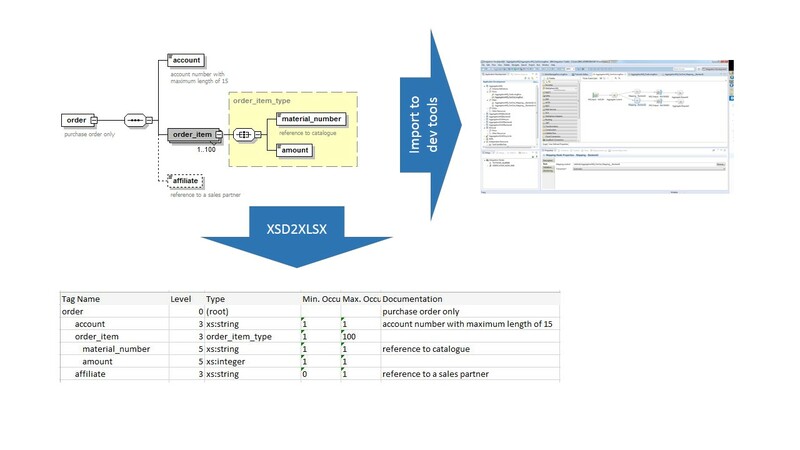 In order to have the parties involved to agree on what data is transmitted there are often Excel sheets (XLSX) used for documentation. Both, the XSD and the Excel file can become quite big and changes have to be done for both files, which is then is often not happening. In order to support the documentation of the XSD, I used Python libraries to parse the XSD and to create the Excel/XLSX file (XSD2XLSX). A big benefit can be achieved if you hold all documentation in the XSD and then just generate Excel (or other) formats for discussion with business analysts. Try out the XSD2XLSX mapping yourself. It is a good practice to have clear ownership of data structures. So you can declare the XSD the master and generate documentation from it and also import it into your development tool.